Community service is integral to a McKendree University education; in fact, it is every student’s first assignment. Before they enter a classroom, open a textbook or turn on a computer, new first-year and transfer students are handed a rake, paintbrush, sponge or shovel and sent “Into the Streets” to lend a hand in local communities during orientation weekend. The University was one of 642 colleges and universities named to the President’s Higher Education Community Service Honor Roll in 2012. Its commitment to civic responsibility is reflected in numerous ways. More than 25 courses, from education to computer science to Spanish, link service to academics. Academic scholarships require a student to complete 15 or more service hours. Bearcat athletes provide muscle and manpower to school and community projects on National Youth Service Day. Scholarships are available to high school students who have demonstrated significant community service. Since 1994, the cornerstone of volunteerism on campus has been the Lyn Huxford Center for Community Service. Under the direction of Dr. Lyn Huxford, professor of sociology, students coordinate weekly service programs at youth centers and nursing homes, for example. McKendree student outreach benefitted more than 44 local agencies and activities last year, from food banks to animal shelters to the Special Olympics. Thousands of miles from campus, McKendreans have helped document and preserve an indigenous tribe’s music in the rain forest of Ecuador. Last spring, a cross-cultural practicum group cleared litter and debris from a beach in Costa Rica, where they studied sea turtles during the nesting season. Elsewhere in Costa Rica, a Campus Ministries mission group shared fun and fellowship as they built new housing and taught Vacation Bible School. Many have spent an “alternative spring break” delivering supplies and building or painting houses in a small Jamaican community. 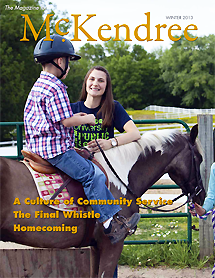 The spirit of service is thriving at McKendree and far beyond. In these pages, you will meet just a few of our many inspirational students, instructors and alumni who are driven to help others.